The training at Guard-Systems, Inc. is a continuous educational program to maintain specific criteria in both site-specific and overall security responsibilities. In addition all state-mandated training will be conducted as required by the Bureau of Security and Investigative Services. The goal is to challenge each officer to become a become a more competent and highly motivated professional at each site he or she is assigned within Guard-Systems, Inc. Additionally, the trainer teaches the officers to recognize that certain principles and techniques such as safety, reporting, observation, and interpersonal relations are the same for all assignments. On the other hand, each customer has special needs, which require specific training on site. Our training program has been designed to meet both general and customer specific training requirements. Training is conducted by the corporate training manager or a trained designate at each district office. This is designed to provide new applicants with basic information regarding policies and procedures. 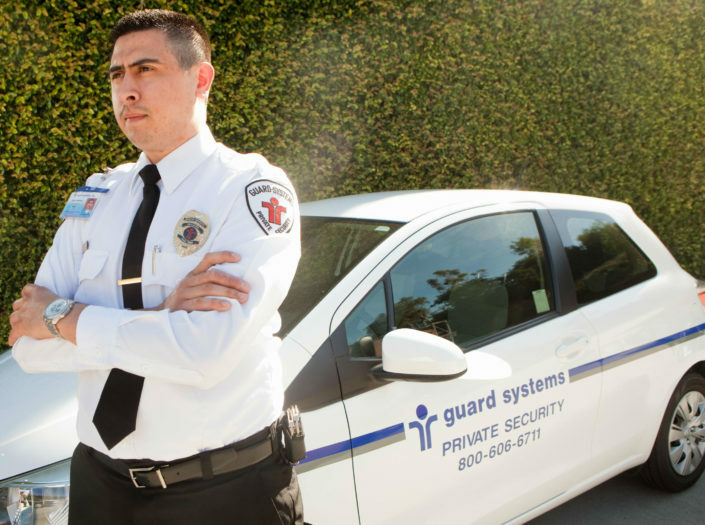 It briefly describes general security duties, benefits, and performance standards of Guard-Systems, Inc. This provides the applicant with guidelines in the area of appearance, hygiene, grooming, conduct, communicating with the public, and public assistance. Also included is building access and exit control, after-hours procedures, identification checks, and safety. Provides training in patrol procedures, legal authority, protection of customer assets, observing and recording, post orders, and personal safety. Concentrates on the basics of report writing(Who, what, why, where, when, and how), The use of reports as legal documents, and completing daily activity reports and incident reports. Emphasis is placed on completeness, accuracy, spelling, and grammar. Provides the applicant was necessary information for handling earthquakes, fires, medical emergencies, security violations, and bomb threats. Also included are procedures for handling hazardous material spills. At any time during this phase of training an applicant may be dropped for poor testing, poor comprehension, or oral and written communication deficiencies. Those applicants who successfully complete this training course are then offered employment with Guard-Systems, Inc. After all other testings and screenings are completed, they are signed to your account. After arrival on post, each new officer is required to complete a site orientation of the customers facility and property layout. Emphasis is placed on specific concern areas as expressed by the customer. The designated trainer will provide initial orientation training and additional training at specific posts. Each newly assigned officer and all backup personnel will receive site-specific training before being assigned to a shift. Supervisor training will be provided in addition to all other training on an as needed basis. Training will emphasize the supervisors role in training and the goal will be to provide supervisors with the information necessary to pass the training along to subordinates. During the first 90 days on site, supervisors, management and customer representatives continually evaluate all officers. Job knowledge, quality of work, decision-making, initiative, dependability, cooperation with coworkers, behavior, communication skills, and attendance are all considered. Management personnel and customer representatives will discuss the officers overall performance and areas of improvement needed. Any “Unacceptable” or “Needs Improvement” areas are discussed with the officers and recommendations for improvement provided. Those areas that an officer has excelled is also discussed. This allows the officer to recognize what he or she does well and also what areas need improvement. During this phase of the evaluation, we determine whether or not the officer conform to the standards set by. In the event the officer receives poor performance evaluation, or shows no initiative to improve in those areas, he or she could be removed from the account and/or terminated from Guard-Systems, Inc.
Refresher training is provided as needed, frequently on a quarterly basis. These classes may include video presentations and testing in such areas as loss prevention, access control, understanding hazardous materials, accident avoidance, safety, and patrol techniques, to name a few. Any mandated training by state or local ordinance is provided as required. In many cases, written tests are administered to ensure both knowledge and understanding of all policies and procedures. As changes are made in policy and procedures, officers are provided with updated training. Supervisors and management personnel are required to maintain knowledge of all changes. As changes occur, management personnel of will monitor employee performance and discuss the training performance with you. As changes are made and training conducted, all assigned personnel are evaluated for understanding performance. This is a continuing process that is in the best interest of personnel, and when changes impact the performance of our employees to the detriment of our customers, we will take necessary corrective action. Counseling, disciplinary action or removal from the post could result. 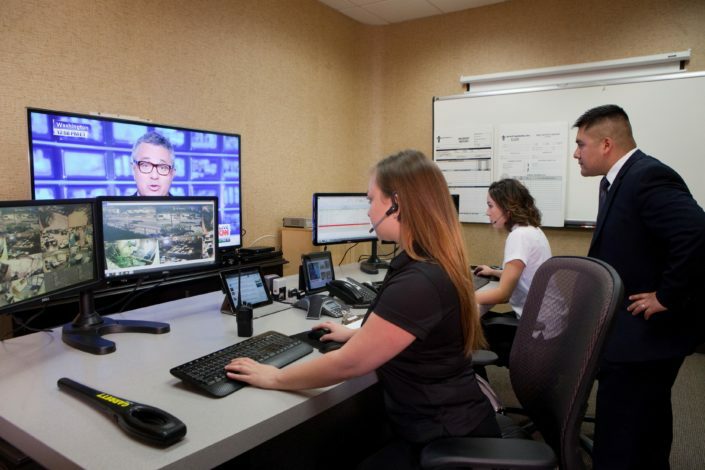 Guard-Systems, Inc. utilizes the services of a professional security television network (PSTN) in the creation of training videos and testing material. Guard-Systems, Inc. also utilize training materials provided by BSIS and The California Association of License Security Agencies Guards in Associates(CALSAGA), which includes the state mandatory powers of arrest and weapons of mass destruction. In addition, we have proprietary video, audio and graphics equipment to customize a training program for any customer. We also have the ability to create site-specific training films to assist in the efficiency of the on-site training program. Video training in conjunction with personal instruction and testing is key to effective performance. Testing and critique sheets assure retention of information and improve the program. We would love to hear from you! Please feel free to call us anytime at (800) 606-6711 or click the “Contact us” button below to send us an email or visit our office. We look to take care of issues before they become problems. Our proactive management approach enables us to meet the customer's needs in a consistent and responsive manner so issues are resolved quickly and efficiently. Want to join the Guard-Systems, Inc. family? We offer above industry incentives and benefits to all employees. Plus, we have an in-house program to provide training and guard cards for qualified candidates.